We are learning more about the Lone Star Tick as more knowledge is released to the public. 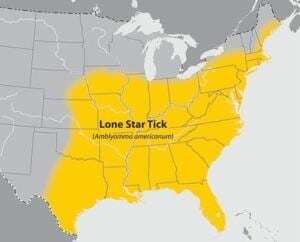 We know that the Lone Star Tick is aggressive and will seek out a human or pet as its next meal. We know that Lone Star Ticks are found throughout southeastern and south-central states and that they do not transmit Lyme Disease. We know that the white "star" on its shell is how the tick got its name. We knew all of this; but we were not prepared to learn that a tick bite from a Lone Star can lead to a red-meat allergy. Some Lone Stars may be carrying Alpha-Gal, the nickname for sugar molecule alpha-1,3-galactose that might cause someone to become allergic to red meat. Currently, there are treatments available for side effects; but no cure or vaccine. Once bitten by a Lone Star Tick, the body's immune system is rewired. Most people realize that they are carrying the Alpha-Gal "allergy" in their system after they eat red meat. Patients that have had allergic reactions from the tick bite experience vomiting, diarrhea, shortness of breath and break out in hives. In the last five years, there have been over 200 tick-related cases involving allergies. "The awareness of Alpha-Gal has grown," noted Stone. "It's also possible that because allergies in general are going up, reactions to Alpha-Gal are increasing." Once you spot the tick, it is critical that you remove it at once. The sooner the better to prevent Lyme! Remember, you will have less than 48 hours to remove the tick before the possible transmission of Lyme Disease. 1) Purchase a Tick Removal Tool. Household tweezers may not be strong enough to successfully remove the tick. 2) Disinfect the tick-biting area with rubbing alcohol or soap and water. 3) Pull the tick straight up. Be sure that the head and body both comes out completely. (Remember: Tick-borne disease transmission is not possible without the tick's head as this is what is burrowed inside the skin.) Do not rush the process so the tick's body does not break apart. If it does break for any reason, remove the broken parts from the infected area - do not leave the remaining body parts attached to your skin. 4) Disinfect the tick-biting area with rubbing alcohol one final time. 5) Place the tick in a sealed container. Store in refrigerator if it is alive, and the freezer if it is dead. 6) Take the tick to a doctor's office quickly for testing to identify the type of tick; and consider testing for Lyme Disease and other diseases.